Join the discussion on our forums! Come discuss Linecracker over in our dedicated Linecracker discussion topic. Overkill: Double this minion's Attack. "Tell me if you’ve heard this one!" "My Turn ? My Turn !" I beg a differ! I cracking everyone with my combo otk priest deck. I played this guy in Arena and got him to 40 attack and 1 health left : ) It was pretty fun but I never got to attack face with him the opponent had waaaaay to many taunt minions top decked I really wanted to smash him in the face for 40 sooooo sooooo BAD! How can I find this card in my Deckbuilder? Is it a huge troll? I cannot really figure it out on the artwork. Yes it's a giant troll on meth, crack, and pcp, and steroids! This card is amazing with anything that grants charge or rush to a minion. On the other hand Gahz'rilla was stronger but never made to the top tier... but now we have different times with warrior's rush and charge cards and Houndmaster Shaw for hunter. Might be okay in arena but standard doesn't seem to welcome it warmly. Well, that's actually neat result! 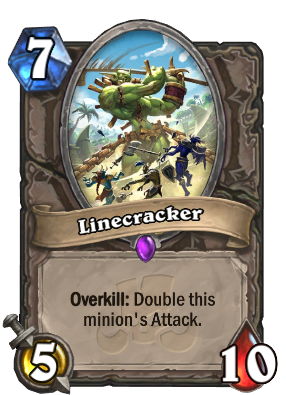 And 7 drops were always kinda bad from evolve so maybe it will break the charm? Good point, mate! Stats aren't that bad, hard dood to kill, this guy could be scary man..